This wickedly good recipe from David Lebovitz’ new book, Room for Dessert, is a cross between a brownie and fudge. It’s made in an interesting way – part of the process involves beating the mix by hand, until it “snaps”, in much the same way as fudge does. This slight change in state gives it a delicious texture – though if you don’t beat it enough, the brownie will be grainy. The recipe is easy to make, using only one saucepan and mere minutes of preparation time. Ensure you have everything measured out before you begin, as the process is very quick once you get started. Also, use the very best chocolate you can afford, as it’s the main ingredient in this recipe. On the topic of chocolate – it’s important to note that this won’t work (at least not in my experience) if you use high cocoa chocolate in in the initial melting part of the recipe. The brownies are perfect when butter and 54% Callebaut callets are melted together, and passable with 64% cacao chocolate, but the 70% resulted in an oily mass that cooked up hard with a film of grease over the top. I think that’s because the quantities in this recipe are so small that if you alter the fat balance (which is what increasing the cocoa mass does) without adjusting the other ingredients, the balance goes completely out of whack. I’ve now made this dish a dozen times and offer two variations – one with nuts as specified in the original recipe (photo above) and the other with extra chocolate. No prizes for guessing which one my boys prefer! 1. Preheat oven to 175C/350F or 160C/320F with fan. 2. Measure out all your ingredients and have them ready to go. Line a 20cm (8″) baking pan with parchment paper. 3. In a medium saucepan, melt the butter, then add the chocolate and stir over low heat until melted and smooth. Remove from the heat and stir in the sugar and vanilla until combined. 4. Stir in the eggs one at a time. Add the flour all at once and stir vigorously until you can feel the batter “snap”. I’ve taken some photos to try and show you what happens – please excuse the slightly blurry one below. The batter starts out grainy and fairly loose. As you beat it by hand, it will initially feel like nothing is happening, and then it will suddenly feel a bit stiffer – that’s when you’ll know a state change has occurred. This might take one minute, or it might take several. Stop occasionally to check how it’s going. Unlike true fudge, it’s not a huge “snap”, but the texture will definitely change noticeably – it will feel stiffer, look smoother, and pull away from the sides and bottom of the pan. Edit Jan 2019: It’s been nearly nine years since I wrote this post, and my hands are nine years older as well, so these days I use a handheld mixer to beat the batter. It only takes a minute or two, but it’s just easier. 5. Gently stir in the inclusions. 6. Scrape the batter into the lined tin and smooth out the top. Bake for 25-30 minutes until just firm. Do not overbake. Allow the brownies to cool completely before lifting them out of the pan and slicing. These are very easy to make and incredibly moreish. Pete recently announced (proclaimed?) the all chocolate version below to be his new favourite brownie! Those do look “wicked good”! I made brownies on a baking spree last week and then forgot them. Really- just place them on a side counter and forgot them completely! I had made some berry dessert (cobbler) and cinnamon rolls and I served them but the brownies went unnoticed. Until I had to have a dessert for our Independence Day picnic. Then I found the pan of brownies and cut them up and made a trifle with pudding and mascarpone cheese and Bristol Creme liquor and whipped cream. Yum! I’m so glad I forgot and them found those brownies. I thinK I will post the recipe on my blog. The trifle simply disappeared from the table in record time. I know what I am going to be baking sometime this week!!! Again…thanks so much for sharing with us all! This is a great recipe because it has measurements in cups and spoons. When I see grams, my heart sinks. Yes, I am an old fashioned American who loves the historical inches, feet, yards and cups, quarts, etc. Anyway, thanks for the recipe. This is one I believe I will try. And thanks for your other charming and interesting e-mails. Oops, just noticed I didn’t include flour in the ingredients list – apologies – corrected now! Patricia, David Lebovitz’ recipes usually have both cups and grams, as he’s an American living in Paris. I have many American friends who are used to using cups and teaspoons, but I personally find my baking results to be much more consistent when I weigh (although I will bake a recipe written purely in cup measures). For me, it’s much easier to always work on a cup of flour as 150g – if I work on scooping with a cup measure, I can get anything from 140g – 165g. Oh drool. They look soooooo good. Oh happy days, they look so incredibly fudgey! I had never heard of the ‘snap’ before and thanks for the tip about the level of cocoa in the chocolate as I tend to just use 70% for everything. These look sinful! …I’m so up for a brownie trifle! I recently got my hands on David Lebovitz’ new book, but haven’t tried to make anything out of it yet. With school hols on now I think it will be a great way to keep kids occupied – for a while at least! can’t wait to tray making these! yumm! Celia you had me at Fudge brownie :P No seriously, does it get any better than this? Funny you mention the high cocoa content chocolates. At Baroque the chef jean Michel said that high cocoa chocolate doesn’t combine well as there isn’t enough cocoa butter. C, these do look wickedly good. Oh how I miss you and your yummy treats. Gosh they look amazingly good Celia…I could certainly do with one of those right now. Did you deliberately post this decadent brownie recipe (my very big weakness) on the first day I am supposed to be working from home? hmm? Your normal posts are tempting enough…making me rush home to cook most of them. But now knowing that I have a kitchen a mere twenty steps away is cause for concern with reading your blog. Perhaps I will have to ban myself from reading your blog until the end of the day….so I don’t rush off and cook whatever it is and waste my entire day cooking, and then eating it?! Good thing I didn’t check it today until I actually came into the old office for some work…. Your fudge brownies look like the real thing!! I so much love that here isn’t too much butter in them! MMMMMMMMMM,…I will make these tasty looking treats! Dan, seriously, these are very easy to make – you won’t even need your much loved KitchenAid! Yvette, looking forward to your recipe! Sophie, there isn’t much butter in them, but there’s also a tiny bit of flour, and I was thinking that you might be able to substitute gluten-free flour? Not sure if it would affect the mixing part? It’s cool and gray here today, and never in a million did I think I would find a cure to my weather blues on your blog…off to the store…bring on the chocolate sunshine! YUM! These look amazing! And I love the step-by-step photos, especially with the explanation of the snap. Must try……. Celia – those are great photos to illustrate your snapping method which I hadn’t really understood. Thank you. I shall of course be trying these out at some point, but I’m getting behind I’ve still got your last lot of brownies to try. Okay…..brownies made and baked and cooling! Hey Celia, I will post some photos soon on my brownies. But I will be renaming them to ‘2 men and a lady’ brownies. That’s how many it took to get the batter to ‘snap’ stage!! Maybe that was because I used El Rey 70% (all I had…). I must get some Callebaut 60%. Do you use it for baking or chocolate making?? Gill, you did better than I. When I used 70%, the batter split (please see post) and turned into an oily mess. Did you adjust the other quantities at all to accommodate the higher % cacao (as per the Bittersweet book)? It should work in the microwave – can’t see why not. Thanks for trying the recipe Gill! 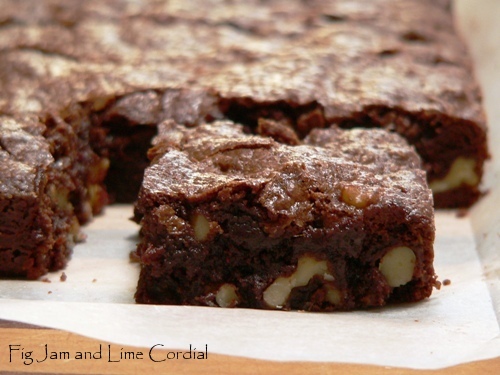 Brownies look just divine – can’t wait to try them! Too often, “best ever” and “world’s best” fail to live up to the hype. Not in this case. This recipe is the only one I shall be using in future. Spectacular yet so simple. Thanks. Lester, hooray! So glad you enjoyed them – thanks for letting me know. pls be so kind & help with yr precious advice the amateur overseas friend of yrs! brownies’ texture came out a little bit sticky, not fluffy. is this expected so? they didn’t result in the normal height; unfortunately I used a 25 cm baking pan. i used a local hellenic brand 53% cacao semisweet chocolate & 68 gr (iof 135 gr) toasted & chopped almonds (iof nuts). i was thrilled with the “snap” stage! you ‘re such a valuable teacher! however the “snap” stage came for me just before to add the flour. was that ok?…. When we had to make brownies today with my daughter’s friend on a play date…..I pilgrimaged here, and have a batch of these int he oven, with crushed thin mint cookies for inclusions! Will let you know how it goes!